Stakeholders discuss what they would like to see replace the parking lots and warehouses in the Village area. Sahra Sulaiman/Streetsblog L.A. This Saturday, January 7, Leimert Park Village (LPV) will host its third 20/20 Vision Initiative Charrette at the Vision Theatre, from 9 a.m. to 2 p.m. Attendees will have the opportunity to participate in a town hall with the neighborhood council, weigh in on the plans and the design competition submissions for the parking lot located behind the Vision Theatre, hear about how the “Taking Care of Our Own” campaign is progressing in its effort to address homelessness in the area, contribute to the evolving vision for the Village, learn about the programming of events on the People St plaza, and more. 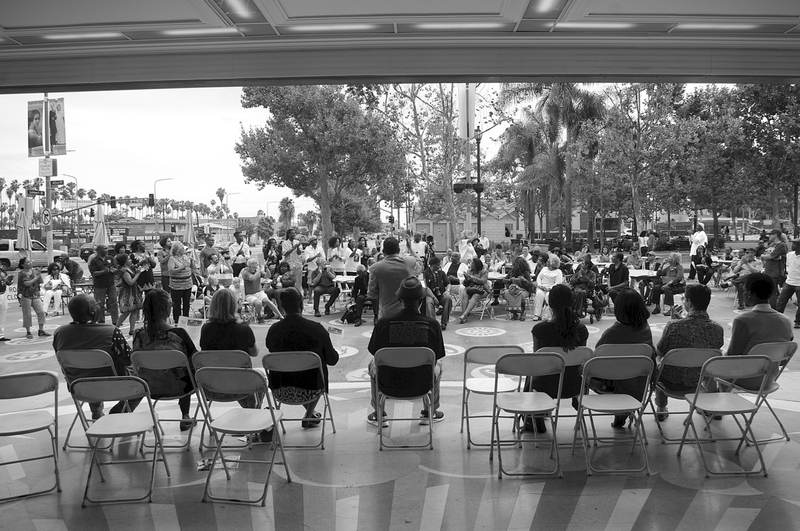 Area residents, artists, and activists had already observed gentrification creeping in around the edges of the historically black community and how turnover had been hastened in anticipation of the opening of the Expo Line in 2013. Then, within weeks of the May, 2013, announcement that there would be a station at Leimert Park, the buildings housing the World Stage and several other businesses along Degnan had been snapped up by an investor who was not responding to requests for meetings from the tenants. The three-day “pay or quit” notices some tenants received shortly thereafter stoked fears that leases would not be renewed and that mainstays like The World Stage would ultimately be displaced. Unwilling to leave the future of the cultural beating heart of black Los Angeles up for grabs, stakeholders began strategizing a renaissance for the area that kept one foot firmly planted in the past – the culture, arts, history, resilience, and ascendence of L.A.’s black community and the larger African diaspora – and planted the other in a future driven by black creatives and innovators. That first design charrette, held in January of 2014, drew nearly 200 stakeholders eager to discuss an overarching vision for the area. Participants debated how to retain the character of the community while working to make Leimert Park a destination, deepen relationships with sister cities or communities, attract investors looking to build partnerships with local artists and cultural caretakers, support black creatives and foster economic development from within the community, and turn the space in front of the Vision Theatre into a car-free plaza. Councilmember Herb Wesson and local dignitaries celebrate the opening of the People St Plaza project in Leimert Park. Sahra Sulaiman/Streetsblog L.A.
Stakeholders have continued to meet on a regular basis to work on implementing that vision. The ceremonial opening of the People St plaza at the second design charrette, held in June of 2015 (above), was the culmination of that first year of work. And the celebration only came after stakeholders had spent the morning in break-out sessions debating year two’s priorities, including the extent to which a cultural center, production and recording studios, tech hub/creative work spaces, and/or retail spaces on the parking lots behind the Vision Theatre could support the 20/20 Vision objectives. 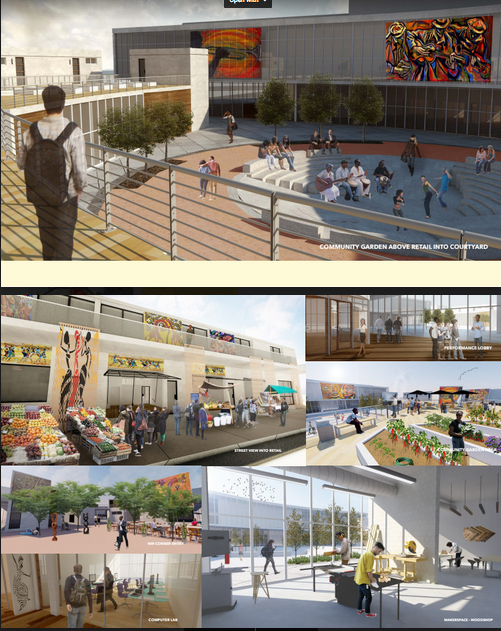 This Saturday, in between planning for the coming year, charrette participants will get a chance to review potential designs for the African American Cultural Museum and Community Center envisioned for the lot highlighted below. The potential future site of an African American Cultural Museum and Community Center, as mapped out for students participating in the design competition. 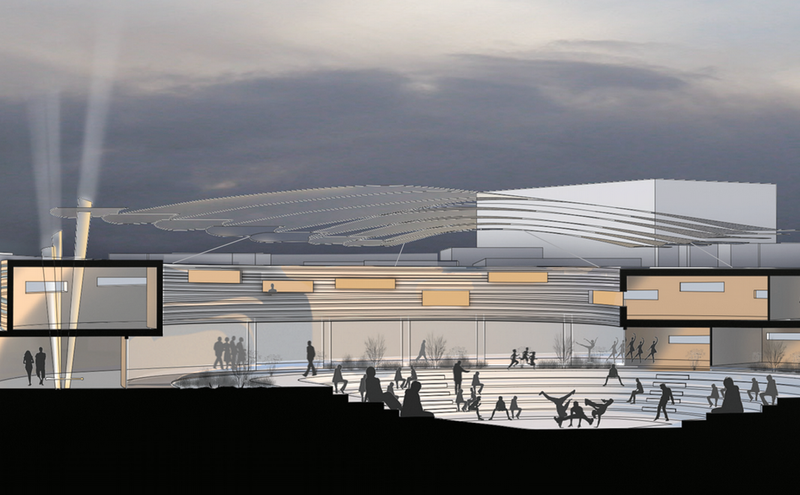 Students were asked to design a structure that celebrated the cultural expression of the community and featured galleries and exhibition spaces, performance and curatorial spaces, a museum gift shop, a 99-seat theater, administrative office areas, meeting rooms, classrooms, music rooms and computer labs, audio-visual facilities for creative productions (recording studio, film studio, etc. ), and outdoor and indoor gathering spaces. A few images from the design submissions can be found below. 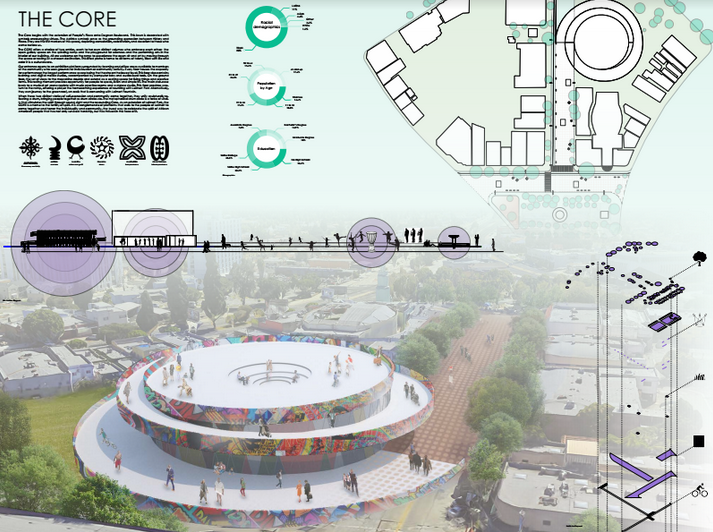 For more about those and other submissions and the vision for the future of Leimert Park, please attend the design charrette at the Vision Theatre this weekend. Details can be found here. The full set of project submissions can be found here. CalPoly San Luis Obispo submission. 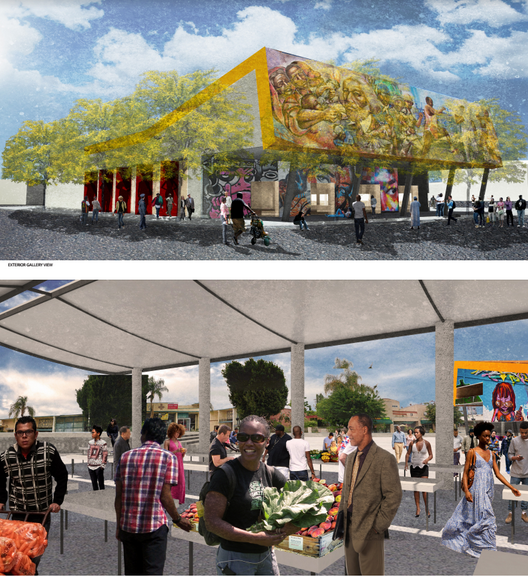 This week: Leimert Park plans its future. SCAG plans Norwalk Green Line. Bike Griffith Park and the north San Fernando Valley. And more! Autonomous vehicles and other emerging technologies are just one more landscape into which community stories can and should be woven. And rather than wait to have to adapt their complex realities to technology that was not made for them or with their needs in mind, artist Ben Caldwell tells me, there is a unique opportunity for communities of color to leave a significant mark.